Civil Defence Minister John Carter today praised three international agreements that will bring New Zealand, Australian and United States civil defence agencies closer together. "These agreements will allow the agencies to support each other during and after emergencies, including maintaining 24/7 contact points as necessary," Mr Carter says. "Our agencies will be better able to share information, expertise and experience to help reduce risks and improve readiness before emergencies." The third of the agreements, a memorandum of cooperation between the Ministry of Civil Defence & Emergency Management and the United States Federal Emergency Management Agency (FEMA), was signed today. The process began in May last year when the Ministry and the Attorney-General's Department of Australia signed a formal administrative arrangement. Emergency management is one of the functions of the Attorney-General''s Department in Australia. That agreement was followed by a Memorandum of Understanding between the Australian Attorney-General's Department and FEMA. As well as setting out arrangements between the two signatories, each agreement also includes provision for multilateral relationships and work in the Pacific region. Civil Defence Minister John Carter will present the Ministerial Awards for Civil Defence Emergency Management in Hastings tonight. The awards were introduced by Mr Carter in October 2009 to recognise career and volunteer personnel with the New Zealand Civil Defence sector. "Emergencies will happen to communities – we don't know when or where, but we know that they will strike. Civil Defence volunteers play an integral and extremely important part in responding to events" says Mr Carter. "I am delighted to be making the presentations to these Hastings volunteers who are all receiving long service awards. All these people have made significant contributions and deserve recognition at a national level," says Mr Carter. Northland Member of Parliament John Carter today announced he will not stand for re-election at the 2011 election. "It is time for me to relinquish my position as MP in Northland," Mr Carter said. "After lengthy consideration, I have come to the conclusion that I will not seek re-election in 2011. "This is my eighth term as MP for Northland, the region where I was born and bred. I believe I have represented Northland well for 23 years. The investment I have made in the region for all of my constituents over this time has been hugely enjoyable and rewarding. However, the time has arrived for me to move on in my life, thus giving an opportunity for new representation in Northland. "I have had an incredible journey during my 23 years in Parliament, with many great experiences and an accumulation of achievements that I feel have steadily improved the lot of the people who have consistently put their faith in me to represent them. "Being a Minister is the pinnacle of an MP's career and I am enjoying the portfolios I have this term (Minister of Civil Defence, Minister for Racing, Minister for Senior Citizens and Associate Minister of Local Government). "Civil Defence has certainly stood out and I hope I was able to give some assurance to the people of Canterbury in the early days after the 4 September earthquake. "I have also enjoyed being part of the team that prepared the legislation to set up the super city of Auckland. "Politics is about people and as politicians we have to spend a lot of time listening to what people want. I chaired the Auckland Governance Legislation Committee and believe we reflected the views of the different interest groups involved with the legislation for a unified Auckland city in the best possible way. "I have also seen first hand, how responsive our Civil Defence Emergency Management Plan is in securing the safety of people. We are leaders in the world in this regard. "As anyone who knows me will know, I will be working hard for the people of Northland and for those whose interests I represent with my portfolios until the day I leave Parliament Buildings towards the end of next year." Civil Defence Minister John Carter is attending the Asian Ministerial Conference on Disaster Risk Reduction in Incheon, South Korea 25-28 October 2010. The first conference was held after the Boxing Day Tsunami in 2004. This disaster highlighted the need for risk reduction through information sharing between countries. "Setting out emergency management strategies to promote reduction, readiness, response, and recovery coupled with community and individual awareness was paramount to lessening the impact of the earthquake in Canterbury." "I'm looking forward to the opportunity to learn about how other nations are prepared and also passing on the lessons learned from the September 4 earthquake". Mr Carter says. Racing Minister John Carter today announced the appointment of Dr Alan Jackson to the New Zealand Racing Board's governing body. "Alan Jackson has been appointed as a replacement member for Alistair Sutherland, who resigned his position so he can enjoy his racing involvement as an owner rather than as an administrator," Mr Carter says. Under the Racing Act 2003, and as a replacement member, Dr Jackson has been appointed until 31 July 2011, but will be eligible for reappointment. Dr Jackson recently retired from the Boston Consulting Group, having served in a variety of global leadership and management positions. He has more than 25 years' experience in business, specialising in business strategy, performance improvement, growth and organisational effectiveness. "The Racing Board plays the leading role in developing policies that capitalise on the potential of the New Zealand racing industry and drive the industry's economic performance," Mr Carter says. "Alan clearly has the skills to meet the requirements of the position, and his appointment is widely supported within the industry." Mr Carter also acknowledged the contribution of resigning member, Alistair Sutherland. "Alistair can look back with a good measure of satisfaction at the Board's achievements, particularly in the face of the recent economic conditions. I am very pleased the Board has articulated a clear strategic direction for the industry. I expect industry organisations to get behind that vision and work together for the betterment of New Zealand racing," Mr Carter says. The Civil Defence awards are designed to complement existing awards, including New Zealand royal honours and mayoral awards. "Emergencies will happen to communities - we don't know when or where, but we know that they will strike," says Mr Carter. "The earthquake in Canterbury is a reminder of just this fact, and serves to remind us that we can't eliminate risk completely. However Civil Defence volunteers play an integral and extremely important part in responding to such events. "I am delighted to be making the presentations to these Manukau volunteers who are all receiving long service awards. All these people have made significant contributions and deserve recognition at a national level," says Mr Carter. Mr Carter introduced the awards October 2009, to recognise the work done by volunteers and career personnel in Civil Defence. Get Ready Week is underway (10-16 October) and this annual awareness raising is likely to resonate with the public after the Canterbury earthquake, Civil Defence Minister John Carter said today. "New Zealand's national civil defence emergency management framework is internationally recognised and of course, a big part of that is public awareness, which is what this week is all about," Mr Carter said. "This country is vulnerable to a number of natural disasters and we have recently experienced one of the worst earthquakes in our history. Around the world people are surprised that no one died in the Canterbury earthquake. "This earthquake is a powerful reminder that we don't know when or where an event will strike. "People will notice more radio and television advertisements this week and the clear message we want people to get is that each household needs to have a plan for what to do in a civil defence emergency. "People may be left to their own resources for a number of days before help can reach them. Airports, road and rail networks may be unable to be used. "You need to have a plan for your family and have essential supplies. Find out what the civil defence emergency plan is for your neighbourhood and where to go if you need to evacuate your home. Your local Council will have a Civil Defence plan. "There is a huge amount of potentially life-saving information at the www.getthru.govt.nz website and there are details there of what supplies you should have to hand. "The Yellow Pages also has Civil Defence information. "There is no better time than now to ensure you are ready to get through an emergency." Integrity issues in the racing industry must be addressed in a professional and independent way, Racing Minister John Carter said today in a speech at the Judicial Control Authority for Racing conference. "There must be no suggestions of cronyism," Mr Carter said. "Indiscretions must not be ignored because of the value to the industry of people involved. Integrity issues must be addressed in a professional and independent way. And there must always be an independent judicial system for a fair trial. "If integrity issues in racing are not vigilantly addressed, everyone who makes their living from this industry is adversely affected. "Every time another person turns their back on racing because they perceive it is not a ‘clean' sport; that move impacts on the incomes of those who make their living from this industry. "Participation is critical to the viability of racing. That is, people owning horses, people attending race meetings and people wanting to bet on horses with the TAB. "And participation is at a critical point. New Zealand racing faces a wagering decline of $1.2 billion in the past 25 years. "People will not invest in an industry - with time or money - if they don't believe in its integrity. "So I am backing industry leaders 100 percent in their moves to act to address drug use and other integrity issues in racing. "A decision was made in June this year to establish a new, independent Racing Integrity Unit and it is on track to be operational from February next year (2011). "This new model of integrity services will give more independence to the "policing" of racing. Making the rule-making, policing and the judicial systems independent and transparent is critical to the integrity of racing. "It is essential that the industry backs its leaders with an understanding that perceptions around the racing industry and corruption need addressing." International Day of Older People on 1 October is a time to acknowledge the contributions older people make to communities throughout New Zealand, Senior Citizens Minister John Carter says. "Mentoring, volunteering, looking out for the neighbourhood, caring for children, sharing wisdom and experience and of course, being in paid work and leading businesses are some of the many ways New Zealanders aged 65 and older contribute," Mr Carter said. International Day of Older People is a United Nations initiative celebrated around the world on 1 October each year. "This is a day to say thank you and to acknowledge senior citizens. I encourage New Zealanders to honour and respect older people," Mr Carter said. "One of my goals as Minister is to change attitudes about ageing and I believe intergenerational activities are a good start. Young people can learn from their elders and vice-versa. With this day falling in the school holidays, it is an ideal time for young and older family members or neighbours to enjoy time together. "One in eight New Zealanders is aged over 65 and this is projected to increase to one in four by 2050. As our population ages, it becomes more apparent that with good health and active lifestyles, people are certainly not ‘old' at 65. The 65-plus group has much to contribute both socially and economically. "New Zealand is a great country to grow older in. We have one of the best and fairest superannuation systems in the world and no compulsory retirement age. The National-led Government is committed to maintaining Superannuation payments for a couple linked to 66 percent of the after-tax average wage, and from the age of 65 onwards and to giving senior citizens lifestyle choices." States of emergency in the three Canterbury districts worst affected by the 4 September earthquake will remain in place until 12 noon Thursday 16 September, Civil Defence Minister John Carter said today. "There were plans to lift the states of emergency in Christchurch, Waimakariri and Selwyn today. However, Mayors in the affected areas have decided to retain the declaration to ensure a smooth and safe transition from states of emergency to a state of urgency across the districts," Mr Carter said. "Safety is still the top priority and Civil Defence officials and the three Mayors believe it is important to err on the side of caution by extending the states of emergency across the three districts until 12 noon tomorrow. "From tomorrow 12 noon, Mayors and Civil Defence officials who have had a lead role in managing the earthquake response in the three districts through the past 10 days will step back from that immediate response role. In the recovery phase they will assist Earthquake Recovery Minister Gerry Brownlee and the Earthquake Recovery Commission. "The mayors and Civil Defence personnel have done an extraordinary job during the past 10 days, often in very difficult circumstances and I have nothing but praise for their work." Civil Defence Emergency Management has passed its biggest test in recent history, Civil Defence Minister John Carter said today. 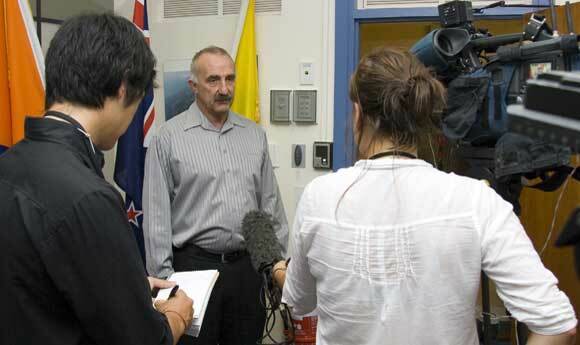 "Six days after the 7.1 earthquake hit Canterbury, most essential services are back in operation," Mr Carter said. "This is due to the incredible efforts of the Canterbury Civil Defence Group, the Canterbury local authorities involved in this emergency and all the support agencies and volunteers that have mobilised to provide essential services and back-up. "New Zealand has an internationally recognised national civil defence emergency management framework and as Minister, I am proud to say it has been tested thoroughly over the past week and not found wanting. "At the forefront of all the process, policy and legislation behind this framework is the safety and security of people, in this case, the people of Canterbury. "People have been affected both physically and psychologically and the Government is committed to helping ensure their lives get back to normal as quickly as possible. "Emergency management plans are tested regularly but it is not until there is a real-life disaster such as this earthquake and the ongoing aftershocks that we really know how well they work. "With this particular emergency, the lead agency in Canterbury is the Canterbury Civil Defence Emergency Management Group. This group is supported in Wellington by the Ministry of Civil Defence and Emergency Management, which is the lead agency at a national level. "People on the ground in Canterbury are making decisions about their region. "There is robust policy and legislation (Civil Defence Emergency Management Act 2002) to ensure firstly, a response to the event and then recovery. Procedures have been developed and tested over the past 15 years. "Within 10 minutes of the initial earthquake on Saturday morning, the Canterbury Group kicked into action. "By 5am on Saturday morning, the National Crisis Management Centre in the Beehive in Wellington was activated. "The emergency management framework allows the civil defence emergency management group in the affected area to make decisions. They are supported by teams representing different agencies at the National Crisis Management Centre, which runs 24/7 during the critical early stages of the emergency. "Decision making is consultative and measured. I have been impressed by the calm leadership I have seen throughout this operation. "It is of course, supported by a wide network of agencies. The Officials' Committee for Domestic and External Security Coordination (ODESC) has met during this event to ensure critical information flows as it should. ODESC brings together the relevant government chief executives to develop strategic guidance for Government and provide advice to Ministers. "Central to emergency management in New Zealand is an all-hazards, all risks, multi-agency, integrated and community focused approach." The day after the 7.1 earthquake hit Christchurch and surrounding areas, the safety of people in the area remains the top priority for Civil Defence Minister John Carter. "I visited the affected areas yesterday afternoon and it is not until you get there on the ground that you are aware of what a significant natural disaster this has been," Mr Carter said. "People of course want to see the affected areas get back to normal as soonas possible, particularly the central business district of Christchurch. However, the infrastructure damage is significant and until such damage is assessed officials and emergency staff in the area and the Government must make the safety of civilians the number one priority. "For this reason, all schools in Christchurch have been closed on Monday and Tuesday (6 and 7 September). Because of the nature of this particular earthquake and damage to the earth such as liquefaction, it requires experts to assess the safety of public buildings. We must ensure children and young people, some of whom have been already traumatised by this event, are safe and secure. "Most schools are likely to open Wednesday, but again, safety must come first. "There are aftershocks and there is bad weather coming. It is vital that people remain prepared tonight and tomorrow by doing things such as keeping torches handy and monitoring the situation via the media and information phone lines and websites. "If you are in any doubt about your safety, please use the welfare centres that have been set up to care for people, or call 0800 779 997. "It has been tremendous to see the people of Canterbury rally around each other in this disaster and this has certainly reduced demand on the welfare centres. It is a great testament to our country that Kiwis can call on family, friends and neighbours - and even in some cases strangers - in times ofemergency. "The Government wants to work with Cantabrians to get life back to normal as soon as possible and Cabinet will meet tomorrow to discuss this issue. "As Civil Defence Minister I believe our civil defence emergency managementsystem is working exactly as it should. All the people on the ground in Canterbury are doing amazing job and the media have run extra programmes and bulletins to keep people informed." Civil Defence Minister John Carter has today launched a DVD designed to give potentially life-saving advice on emergency planning to the deaf and hearing impaired. "Deaf Aotearoa has collaborated with the Ministry of Civil Defence & Emergency Management to produce this valuable resource," Mr Carter said. It is estimated that about 10 percent of New Zealand's population have hearing difficulties of some degree. Information is provided in New Zealand Sign Language and is also captioned. "Public education is essential to ensure New Zealand is resilient to the number of natural hazards we are vulnerable to including earthquakes, tsunami, volcanic activity and weather related emergencies," Mr Carter said. Disability Issues Minister Tariana Turia said she welcomed the initiative and that it was important to include everyone in safety messages, including people with disabilities. "This DVD encourages those who are deaf or have significant hearing impairment to plan ahead for their specific requirements in an emergency. It focuses on developing an emergency plan with friends, family and neighbours," Mrs Turia said. "It also provides valuable advice to those who may be caring for someone with a hearing impairment, encouraging them to plan ahead and build a support network to help in an emergency." "We all need to be prepared and know what to do when disaster strikes," Mr Carter said. "The message is simple. All individuals and communities have a responsibility to look after themselves and their loved ones for at least three days, possibly more, until help can get to them. "This resource is part of a wider public education programme that includes the Get Ready Get Thru website, radio and television advertising, brochures and the What's the Plan Stan? education resource for primary schools. "The best way to get through an emergency event is to be prepared, and I can't stress that enough." A change to the enduring power of attorney law finds the balance between protecting rights and dealing with the real-life situations of older people, Senior Citizens Minister John Carter said today. "Protecting the rights and interests of older people is one of my key priorities," Mr Carter said. "So I am happy with the recent amendment to the Protection of Personal and Property Rights Act 1988 that makes it easier for two people to appoint each other their enduring power of attorney. "This technical amendment addresses an issue that was brought to my attention as a problem, especially for older couples. "These couples and other mutual appointees can now seek advice and use independent witnesses from the same law firm or trustee corporation. "Prior to this amendment, each person had to go to a separate law firm or trustee corporation. Many couples had a trusted law firm and were unhappy with this. "It presented a problem for couples living outside cities in particular, those accessing services in smaller towns that may have only one law firm. That situation left one person having to travel, sometimes considerable distance, to consult someone they didn't know and didn't necessarily feel comfortable with. "This small amendment provides the essential balance between protecting older people's rights and the reality of dealing with people in real-life situations." The amendment was effective from 7 July 2010. A full review of the Protection of Personal and Property Rights Act 1988 is set for 2013. Raising awareness, talking about the issues and thinking about responsibility are the keys to tackling elder abuse and neglect, Senior Citizens Minister John Carter said today. Tuesday, 15 June 2010 is the 5th World Elder Abuse Awareness Day. "My goal is that everyone in New Zealand knows how to spot elder abuse and how they can deal with it," Mr Carter said. "All older people should be treated with respect and dignity - end of story. "It saddens me that there are older people in New Zealand who are lonely, neglected, afraid, and at the worst end of the scale, being abused. It is not OK for us to ignore people who might be friends, neighbours, family members or someone we know about in our neighbourhood. "Abuse can be physical, psychological, sexual or financial - the stripping of assets and leaving older people in poverty, unsafe and fearful. "The It's Not OK campaign against family violence includes an information booklet called Take the Time...Value Older People. This is one source of information on identifying signs of elder abuse and what to do to get help. We need to speak up when we suspect something is not right. "It is important there is public discussion about what elder abuse is. This is the way communities have come to learn about child abuse and domestic violence. "I am pleased to report the Ministry of Social Development is further raising staff awareness of elder abuse and neglect to ensure frontline staff know what to do when they encounter cases of suspected or actual elder abuse or neglect." For more information, visit the Are You OK website. Budget 2010 is good news for those receiving New Zealand Superannuation, Minister for Senior Citizens John Carter says. "In addition to receiving an income tax cut, recipients of New Zealand Superannuation will be fully and permanently compensated for the increase in GST from 1 October 2010," Mr Carter says. "This means people who receive New Zealand Superannuation will get a considerable increase to their after-tax income. "For example, a married couple on NZ Super with no investment income will get a tax cut of $11.52 a week, a $10.12 increase in their NZ Super payments and pay an extra $10.87 in GST. Overall they are $10.77 a week, or about $560 a year better off. "The compensation component of this increase will never run out or expire, as the usual adjustments from 1 April 2011 will ensure this is permanent." The 2.02 per cent increase in payments to recipients of NZ Super to compensate for the increase in the rate of GST reflects calculations of the actual effect on prices of the rise in GST. "Both Statistics New Zealand and the Treasury have advised that the expected increase in the Consumer Price Index (CPI) as a result of increasing GST is about 2 per cent. That is based on prices on items covered by GST going up by 2.22 per cent, but only about 91 per cent of spending on goods and services is on items that incur GST," Mr Carter says. Items exempt from GST include rent for private premises, mortgage repayments, school donations and some credit service charges. If local authorities factor the GST increase into the rates-setting process for 2010/11, the rates rebate scheme will be adjusted to take account of the corresponding upward CPI movement. "Many older New Zealanders have saved for their retirement and we donâ€™t want the GST increase to reduce the effectiveness of those savings. That is why we have cut the tax rates on interest earned from investment and savings," Mr Carter says. From 1 October 2010 resident withholding tax (RWT) rates applying to interest will be reduced so they align with the new personal tax rates. The rates for Portfolio Investment Entities and managed funds will also drop. These changes will increase after-tax earnings on savings. "This Government is committed to maintaining the New Zealand Superannuation married rate payment at 66 per cent of the after-tax average wage, from the age of 65," Mr Carter says. More information on how Budget 2010 tax changes affect superannuitants, including tax calculators, can be found at the Tax Guide website. A $2,255,983 cheque from the Lottery Significant Projects Fund shows those behind the Kauri Coast Community Pool that thinking big pays off, John Carter MP for Northland says. "This $6 million pool complex is a big project for a place the size of Dargaville. So it is fantastic to see acknowledgement of the benefits of this ambitious plan to both the local community and Northland with this grant from the Lottery Significant Projects Fund," Mr Carter says. "Kauri Coast Community Pool is a great regional success story. It creates economic opportunities for Dargaville with the many visitors from out of town who will come to use these excellent facilities and stay on to patronise other businesses in the town. It provides elite swimmers and those aspiring to be elite swimmers with the only 50 metre pool in Northland so they can train at the standard they need. We are always happy to see great athletes represent our region. "The pool complex is also innovative in the use of Northland's great natural resource, the sun. It has one of the biggest solar swimming pool systems in New Zealand to heat the main pool as well as the hydrotherapy, learners' and toddlers' pools. "And certainly not the least, it is a fantastic community asset for young and old alike. I believe that since opening in January, the complex has been enormously popular and patronage has exceeded expectations. There are so many health benefits from getting out and being active and it is important for all New Zealanders to be able to swim at least enough to survive, particularly for those of us living near so much water. "I am proud to say that to receive this level of funding from the Lottery Fund a project must be well designed, planned, managed and sustainable. So it is a credit to everyone involved and the enormous efforts on their part that Northland now has this top class facility." SuperGold Card holders now get concessions from the Hurricanes Super 14 franchise, Senior Citizens Minister John Carter said today. This new partnership sees the Hurricanes offer a buy one and get one free deal to all SuperGold Card holders wishing to attend home games at Westpac Stadium this season. The next home game is this Saturday 27 March, against the Sharks. "It's great to have the Hurricanes on board as a SuperGold Card partner," Mr Carter says. "They join 1113 business partners covering 5141 outlets that offer discounts and concessions to our senior citizens aged 65 and over. We are looking at issuing the 550,000th SuperGold Card this month and there are nearly 57,000 cardholders in the Wellington region. "New Zealanders of all ages will have fond memories of spending a family weekend afternoon at the rugby, watching their heroes play. "The Hurricanes' offer gives our senior New Zealanders the opportunity to carry on that tradition and spend some quality time with family or friends." Mr Carter's sentiments are echoed by Hurricanes CEO Greg Peters. "There's no denying the important role rugby plays in New Zealand society," Mr Peters says. "Supporting the SuperGold Card is a great way to recognise the contribution senior New Zealanders have made to the game and to the wider community. "I would encourage SuperGold Card holders to bring a family member or a friend to Westpac Stadium and help support the Hurricanes in their 2010 Rebel Sport Super 14 campaign." This offer is available for the 2010 Super 14 and 2011 Super 15 season. The SuperGold Card is a free discount and concession card available to New Zealand residents aged 65 years and over, and those under 65 years receiving New Zealand Superannuation or the Veteran's Pension. At the end of February there were 549,653 cardholders and this grows by about 1000 to 1200 per month. The SuperGold Card allows its holders access to a range of business discounts and facilitates easy access to government and local council services, entitlements and concessions. Despite the death and destruction caused by the massive earthquakes in Haiti and Chile this year, most New Zealanders are still complacent about preparing for such an event here, Minister of Civil Defence John Carter said today. Statistics released today â€“ the New Zealand General Social Survey 2008 fact sheet on preparedness for natural disasters â€“ show that just 15 percent of households are well prepared for a natural disaster with enough food and water stored to last three days and an emergency plan. "Last weekend, while authorities were preparing for a tsunami in the wake of the Chile earthquake, some New Zealanders were still not taking the situation seriously or heeding the warnings," Mr Carter says. "Most people realise these warnings are not issued lightly though and went to seek out information. There were 44,000 visitors to the Ministry of Civil Defence and Emergency Management's website on Sunday. But leaving it until the day of a disaster might be too late. "New Zealand is vulnerable to unpredictable natural disasters such as earthquakes and tsunami, as well as weather related emergencies. People need to know what this means and that they won't always get a warning. "While we have excellent civil defence emergency planning, as we witnessed last weekend, how well prepared communities and individuals are is what will make the difference on the day there is an emergency situation. "There will be a period of time when households and communities might be isolated and without essential services. There may be massive infrastructure damage taking out roads, airports, rail tracks, power, telecommunications and water. "We are also geographically isolated from our nearest neighbours on whom we might call for help, so any international emergency response might take days. "Every household needs to have a plan for this eventuality. Get your family or household together and agree on a plan. This includes knowing where to shelter in an earthquake, flood or storm; knowing where you will all meet up during and after a disaster; and knowing where you have emergency survival items stored. "Every household also needs to be prepared for evacuation with a basic getaway kit. "Perhaps also get the household together and research what happens when a major earthquake occurs and what a tsunami is. On Sunday people were quoted as saying they would run if a tsunami hit but of course, you cannot run as fast as a tsunami surge." New Zealanders who didn't heed the national tsunami warning issued yesterday in the wake of the Chilean earthquake, need to realise this was a serious event, Civil Defence Minister John Carter said today. "A national warning is not issued lightly," Mr Carter says. "Amid reports of people going to the beach or spectating, we also had reports of people getting caught in the powerful water surges that make up a tsunami and rapid water-level rises in some areas. "There was definitely potential for loss of life in our waters and it is a credit to the team who managed this event that didn't happen. "However, most New Zealanders heeded the warnings and I am proud of how the Ministry of Civil Defence and Emergency, local Civil Defence Emergency Management groups, police, fire, coastguard, and volunteers worked together to manage the situation. Mostly, they were able to warn people and to keep them off the beaches and out of the water. "The media also played a crucial role in keeping people up-to-date and informed as the situation unfolded. Communication with the media was an area that needed improvement after the Samoan tsunami warnings last year and I am pleased to say the relationship with the media went exceptionally well this time. "The tragedy of this situation is what has happened in Chile. Our distance from the earthquake meant we had plenty of time to prepare and we were well prepared. "However, if an earthquake of this magnitude strikes 20 kilometres away from one of New Zealand's major cities, there will be no warning time. We have some of the best civil defence emergency planning in the world, but in this event, there would be a period of time when households and communities might be isolated and without essential services. "Reality for New Zealanders is that we are vulnerable to certain unpredictable natural disasters, such as earthquakes and tsunamis. We are also geographically isolated from our nearest neighbours on whom we might call for help, so any international emergency response might take days. "Every household should have an emergency plan that includes knowing what to do during and immediately after a significant earthquake. I am encouraged to hear that after yesterday's event, there has been increased traffic to the Ministry of Civil Defence and Emergency Management's website as there is excellent potentially life-saving information on this site. The site averaged 350 visitors a day in February and that escalated to 44,000 yesterday. "The Ministry also has RSS and Twitter feeds on the emergency status bar on the website. On Friday evening there were 166 followers on Twitter and this morning there are 1347. "I urge all New Zealanders not to delay their emergency planning and to take warnings seriously when they are issued and follow the precautions recommended until such warnings are reduced and then lifted." The opening of nominations is due to the expiry of a current Board member's term on 31 July 2010. "Racing is a dynamic business that employs a significant number of people. They look to the Board to lead the industry and facilitate long-term planning that ensures its sustainability. "New Zealand racing has a rich history, but like many businesses today it is facing challenges attracting participation and competition for the discretionary dollar. "Board members need both the experience to manage this and the passion to see the racing industry well placed for the future." An appointment is expected to be made for 1 August 2010. Nomination forms and further details about the Board's membership, functions and powers can be obtained from the Department of Internal Affairs website or by phoning (04) 495 7200. The closing date for receipt of nominations is Friday 9 April 2010. With spending up more than 20 percent and top international buyers seeking the catalogue stars, the national yearling sales show the intense demand for New Zealand thoroughbreds is unabated, Minister for Racing John Carter said today. "Seven days of yearling sales ended at Karaka yesterday with total sales of $93,567,400, more than 20 percent up on the previous year's total of $74,867,700," Mr Carter says. "It was not only the premier sale that attracted high prices, higher average sales and international buyers. That happened across the select and festival sales as well, showing the strength and depth of our yearling crop. "Horses are important to the New Zealand economy. Each year they earn about $130 million in exports, support about 18,000 full-time jobs and contribute about $1.5 billion to the economy. "We are a small nation, but in horse breeding we punch above our weight. "New Zealand's foal crop is a fraction of Australia's â€“ approximately 4500 versus 17,000 â€“ so it is a credit to our breeding industry that we continue to make such a positive impression across the Tasman, one of the most highly regarded racing environments in the world. "Sydney-based bloodstock agent James Bester paid the top sale price of $2 million for a colt by champion sire Zabeel and he was one of a number of Australians spending more than $2 million on total yearling purchases. Among them were the likes of the highly regarded Sydney trainer Gai Waterhouse and Melbourne trainer Danny O'Brien. "There are also markets further afield, with Jayven See from Singapore paying $1 million for a colt and Hong Kong agent Justin Bahen buying 15 yearlings across the series, which is fantastic to see. "While we like to see our horses do well off-shore, the bulk of the horses at the national yearling sales feed into our own New Zealand racing industry. In fact, one of the top buyers overall was New Zealander David Ellis. "Breeders are the foundation of our domestic racing industry. The success of that industry is dependent on the quality of horses. Performances on the track, particularly by horses who are supreme athletes, draw the crowds. And the top tier racehorses foster New Zealand's international reputation for producing some of the best quality horses in the world. "I am heartened to see the results from the 84th National Yearling Sales series at Karaka and hope the yearlings sold in the past week will fulfil their promise for the many owners who will race and possibly later breed from them." Young people will be getting their voice heard when they take over New Zealand's Parliament in July for Youth Parliament 2010. Northland MP Hon John Carter has now opened his selection process for Youth Parliament 2010. Youth Parliament 2010 is open to young people aged 16 â€“ 18 years old who want to represent young people's views to Ministers and Members of Parliament. "I want to hear from young people who have a passion for the future of New Zealand and are willing to stand up and have their voice heard," Mr Carter says. Youth Parliament 2010 will be a significant opportunity for young New Zealanders to share their views with the country's decision-makers. In May 2010, the Minister of Youth Affairs, Hon Paula Bennett, will announce the Youth Parliament 2010 Bill to be considered and areas of inquiry. Youth Parliament 2010 is a joint initiative of the Minister of Youth Affairs and the Speaker of the House of Representatives and is organised by the Ministry of Youth Development in collaboration with the Office of the Speaker of the House of Representatives, the Office of the Clerk, the Parliamentary Service and New Zealand's 122 Members of Parliament. Anyone interested in becoming a Youth MP should contact Hon John Carter on the details below or contact the Ministry of Youth Development. The National-led Government is working hard to make sure all New Zealand children get the quality education they deserve. Currently too many of our children are slipping through the cracks and missing out on the brighter future they deserve. One in five of our children are leaving school without the reading, writing and arithmetic skills they need to succeed. Before the election, National promised to address this shocking statistic. This year, we're delivering on our promise with the introduction of National Standards to primary and intermediate schools around the country. National Standards are simply signposts which describe what Year 1 to 8 children should be able to achieve and by when. Teachers will assess, monitor and report on each child's progress against the Standards. Schools will report to parents and families twice a year in plain English. Each Plunket-style report card will show a child's goals, progress, and achievement in relation to the Standards. For the first time, parents will be getting the accurate information that they deserve about their child at school. We're investing $26 million to train and support teachers as they implement National Standards, and $36 million to help students identified as needing extra help. A report from the Education Review Office at the end of 2009 showed that almost two-thirds of schools do not monitor children's performance well, and that three-quarters of principals don't set expectations of high achievement levels. This shows the urgent need for action. Teachers will use a range of existing assessment tools, as well as their professional judgment, to measure students against National Standards. Many schools already use assessment information to raise student achievement, but we need to get the basics right. We need to find out which children need help, and how much help they need. National Standards are about lifting the performance of every child, and making sure that parents and families can understand the progress of their child. The future of our children is at stake. If you can't read and write, you can't participate in the modern economy. This is an exciting year for education. National Standards is a groundbreaking policy, and a critical part of this Government's plan to secure a brighter future for all New Zealanders. Minister of Civil Defence John Carter today announced that E-Sponder will supply an electronic emergency management information system (EMIS) for use in the National Crisis Management Centre (NCMC) and by civil defence authorities. The NCMC, below ground under the Beehive, is designed to be a national operations centre. From there the responses of the hundreds of organisations likely to be involved in a large scale emergency can be co-ordinated and a national emergency can be managed. "This EMIS will help us to better manage emergencies," Mr Carter says. "It will allow us to more quickly and accurately create, and then keep up to date, what is known as a 'common operating picture'. We use that to ensure that all agencies involved have the same understanding of the situation, who is doing what, where resources are and what decisions are being made. "That means we will have a faster, better co-ordinated response and, ultimately, a safer, more resilient country." Mr Carter said that E-Sponder is an off-the-shelf system already used by the Ministry of Foreign Affairs and Trade, in the Australian federal government and by some United States state and county governments to manage information during emergencies. EMIS is part of a series of upgrades for the NCMC that include expanding alternate communications and installing video conferencing facilities. Cabinet allocated a budget of $2.8 million for all three projects. The EMIS contract is being negotiated and will be signed shortly. EMIS will be rolled out by mid-2010 and will be hosted by the Ministry of Civil Defence and Emergency Management. Between January and June staff from the Ministry, Civil Defence Emergency Management (CDEM) groups, territorial authorities and E-Sponder will work together to ensure that the system is appropriately configured for use at local, regional and national levels. They will also develop a testing regime before the system is rolled out. In March, the Ministry will hold an information conference where the system will be demonstrated to CDEM groups and territorial authorities. System administration and management will also be explained. Three Government Ministers have taken a first-hand look at Northland's drought conditions and are offering help for the area, John Carter MP for Northland said today. Today (Friday 22 January) Mr Carter and Phil Heatley, MP for Whangarei visited farms in the region with Agriculture Minister David Carter and talked to farmers and their representatives. "Today we have seen how serious the situation is. It has been very useful for Phil Heatley and myself as local MPs to look at the situation first-hand with David Carter, who is a farmer and has a good understanding of the impacts of drought in the short and long-term. 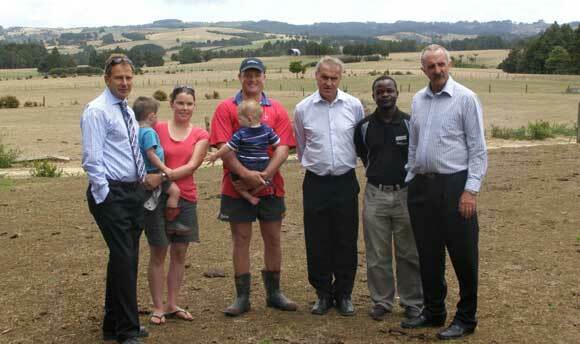 He is fully committed to helping rural communities through this," Mr Carter says. "The Government has declared Northland as a medium-level drought zone and a drought recovery package is now in place to help affected farms. "The offer of support from the Government has been well received by the people we have met and it is important drought-affected farmers know where to go for help. There is no question this is a serious issue with short and long-term implications. "Farmers can talk to their local Rural Support Trust to seek advice. Federated Farmers can also offer advice and the Ministry of Agriculture and Fisheries have a drought guide." All three of Northland's districts â€“ the Far North, Whangarei and Kaipara â€“ are affected. Occupation by John and Wikatana Popata of private land at Taipa is inappropriate, John Carter MP for Northland, says. "As the MP for Northland I reiterate what Prime Minister John Key has said about this land that is up for sale," Mr Carter says. "That is, that the Government is quite clear in its view that private land has never been part of the Treaty settlement process and won't be part of the Treaty settlement process under a National government." Mr Carter contrasted the protestors' occupation with the good faith established last weekend when the Crown and Te Hiku Forum signed an Agreement in Principle at Roma Marae. The agreement towards settling historical Treaty of Waitangi claims in the area provides for commercial redress of $120 million between the five iwi. "This agreement is good for the Far North and shows what can happen when the Crown and iwi work together ," Mr Carter says. "The land in question is up for sale so anyone interested can look at purchasing it." There has been some discussion in the Herald about the new Auckland Council and the roles and functions of local boards. This Government wants to ensure that Auckland, as New Zealand's largest city, attracts people and investment and offers a first class infrastructure and lifestyle. We are committed to making this great city unified with a structure that delivers greater efficiencies through less duplication and waste and that is able to progress important issues faster. Aucklanders have told us they want this. Providing better services to Auckland is the object of the exercise. On the matter of local boards, let's not judge them before they even exist. Local boards are an important part of the Auckland reforms under the Local Government (Auckland Law Reform) Bill. They are new entities that are unique to Auckland. They are different to what has gone before them and they are not the same as community boards or district councils. They have great potential to breathe new life into local government. They present an exciting opportunity for each community. So it is disappointing to see editorials and articles demanding that Government set down a specific range of activities to be undertaken by local boards at this early stage. While the reorganisation of local government in Auckland is complex, the end goal is simple and logical. From New Zealand's largest city the Government wants strong regional governance, greater community engagement, local decisions on local activities, improved connections across the region and improved value for money, that is, a better return for rates and government funding. Putting the "local" back into local government in Auckland has been what has been asked for stridently, via submissions and Select Committee hearings, since the Government embarked on these reforms. We have listened and believe local boards provide the solution. Each local board will be unique and will address matters exclusive to its community. It may have a local view different from its neighbour. The key driver is that local boards will make local decisions about local activities. For example, the Waiheke local board is likely to be entirely different from the Waitakere local board and many of their respective needs and requirements will be quite distinct. Getting it right for each local board and taking into consideration each one's particular characteristics requires careful consideration. That is why the Government established the Auckland Transition Agency (ATA) and charged it with planning and managing all matters in relation to the reorganisation of local government in Auckland, including defining the role, functions, powers and duties of the local boards. ATA has specialists doing the forensics on each function to ensure that every "local" function is picked up and appropriately delegated to each of the local boards. If the function is of local significance, then it will lie with the local board. Bearing in mind the end goal of strong regional governance and improved value for money, if it is of regional significance it will be accorded regional status, with governance and decision making undertaken by Auckland Councillors. The expertise and work required to sift through these functions and delegate them in a meaningful way so that each local community achieves its best outcome is far too detailed to prescribe in legislation and is likely change over time. It is wrong to suggest that this is where this function belongs. People will be surprised at the detail that will result. Such detail will show why it was impractical for a parliamentary Select Committee to attempt to undertake this task. I am confident that the local boards will present a unique opportunity for the different communities that make up Auckland. I expect these local boards will evolve over time and that they will deliver on the vision of Auckland as a local government leader. The Government is closely monitoring the Northland drought situation, John Carter MP for Northland, says. On Friday Mr Carter and Phil Heatley, MP for Whangarei, will join Agriculture Minister David Carter as he tours the Northland region to look at the dry conditions. "As local MPs Phil Heatley and I have been in regular contact with the Agriculture Minister and appreciate that he is travelling here to see first-hand the challenging conditions facing farmers in our area," Mr Carter says. "David Carter is also a farmer, so he is well aware of the impacts of drought not only on farmers, but on rural communities and the economy as well. We understand that the effects of drought are long-term and that the odd shower or cloud burst doesn't fix that." Staff from the Ministry of Agriculture and Forestry are actively monitoring the situation and liaising with Rural Support Trusts in Northland. Mr [John] Carter says the Government is committed to offering support as required and processes are in place to provide special assistance if drought is declared. That can include provision of tax assistance measures, funding for farm management advice and funding for Rural Support Trusts to provide help.